It's been an interesting ride for tech investors over the last year. Advanced Micro Devices (NASDAQ:AMD) has overcome a challenging environment for gaming graphics cards, with strong demand coming from data centers. The stock is up 193% over the past year, as the chipmaker's future looks promising after gaining ground on Intel last year in the server market. Investors are taking a more cautious stance with Cypress Semiconductor (NASDAQ:CY), a leading supplier of wireless connectivity solutions for the consumer, industrial, and automotive markets. Despite the growth opportunities in the Internet of Things (IoT) and the rollout of 5G connection speeds, Cypress faces near-term headwinds, but that is allowing investors to buy the stock at a bargain price. We'll review both companies on growth, financial fortitude, and valuation to determine which stock is the better investment. AMD saw revenue jump 23% year over year in 2018. This performance was achieved despite the falloff in shipments of graphics processing units (GPUs) for gaming in the fourth quarter, which was caused by a supply overhang as a result of the cryptocurrency collapse. Data center products now make up a mid-teens percentage of total revenue, as AMD continues to score wins with major organizations and take share from Intel in the server market. The graphics-chip maker is in an excellent position to see further growth in 2019 and beyond. The company is gaining share in the client CPU market, with several top computer brands launching new notebooks featuring AMD's Ryzen mobile processors and Radeon Vega graphics cards. In addition, sales of gaming GPUs should pick up again in the next few quarters, as management noted on the last conference call that channel supply levels are coming down as partners drain their inventory. Elsewhere, AMD is seeing strength in the data center market, with Amazon.com and Microsoft continuing to use AMD chips in their latest cloud offerings, not to mention new wins with Procter & Gamble and the U.S. Department of Energy. Management is calling for high single-digit growth in revenue in 2019. A shift in sales mix to higher-margin products, including Ryzen, EPYC server chips, and Radeon data-center GPUs, should continue to lift gross margin. Analysts expect AMD to grow earnings per share by 39% this year and 34% annually over the next five years. On the other side, Cypress is not growing nearly as fast. Revenue was up only 6.7% last year, but higher margins pushed adjusted earnings per share up 53% year over year. While Cypress has substantial growth opportunities supplying chips for IoT and the buildout of 5G infrastructure, the near term will be challenging to navigate. The company recently saw softening demand coming from China and the rest of the world. As a result, management expects first-quarter revenue and adjusted earnings per share to be down 8% and 11%, respectively, at the midpoint of guidance. Analysts don't expect a quick turnaround, as the consensus estimate anticipates that Cypress will report a decline on both the top and bottom line for the full year. However, analysts expect Cypress to grow earnings 10% per year over the next five years. Cypress is well positioned to capitalize on the adoption of IoT, in which it has an industry-leading Wi-Fi and Bluetooth offering. The penetration rate of smart-home devices is expected to double by 2022. Also, Cypress is in the pole position for the continued adoption of USB-C (an emerging USB technology standard) across PCs, automotive, mobile devices, and other products. Cypress has good growth prospects, but AMD has the momentum and is growing much faster. 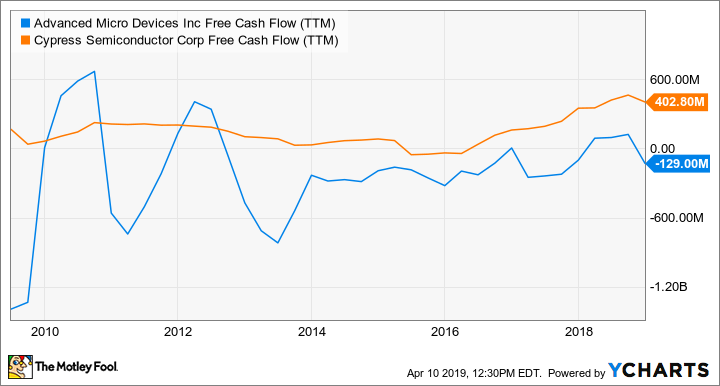 I generally favor companies that are consistent at generating free cash flow over ones that are not, so with Cypress' superior record, I give it the edge here. Which stock is the better deal? Data source: Yahoo! Finance. P/E=price to earnings. PEG=price to earnings growth. While AMD has the lower price-to-earnings-growth ratio, I lean toward Cypress. First, Cypress stock has a low price-to-earnings multiple which means it will likely hold up better if things get shaky in the market, especially relative to AMD's high valuation. To sweeten the deal, Cypress pays a generous dividend yield of 2.86%, which is the result of Cypress' consistency at generating free cash flow. Both stocks have something to offer investors looking for growth. However, AMD's higher valuation makes the stock more susceptible to periods of market volatility, as we saw last year when the shares were cut in half over worries about the aftermath of the cryptocurrency meltdown. Cypress isn't without risks, but the stock's dividend payout and relatively lower valuation should come in handy if the economy suddenly turns south in the short term.